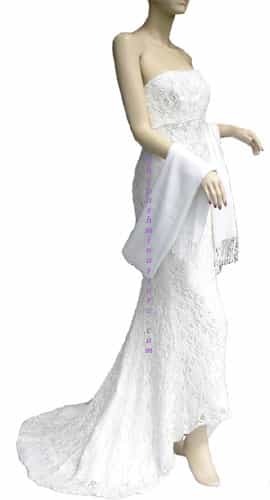 The Pashmina Store is proud to have been a special part of hundreds of weddings and to have our pashminas given as thoughtful bridesmaid gifts to be enjoyed long after the wonderful occasion. Our pashmina shawls, wraps, and scarves are a beautiful addition to any wedding ceremony and are a bridesmaid gift that is sure to be appreciated for years to come. If you are looking for a special wedding, bridal or bridesmaid gift, look to The Pashmina Store. An elegant and fashionable pashmina scarf, shawl or wrap is always appropriate and appreciated. Our quality pashminas have been featured in and recognized by many websites, newspapers and magazines, including "Brides Magazine," "Southern Bride Magazine," "Good Housekeeping," and even "Inc Magazine." "The pashminas were a huge hit with the guests and they look beautiful in the pictures! Also, just a reminder to look for the magazine and your pashminas in December when the magazine comes out with the wedding featured!" "Thank you, thank you, THANK YOU!! I don't remember the name of the person who helped me (it was a guy), but he was amazing and super nice. I was looking for orange pashminas for a bridesmaids gift, and he talked me through the colors, which style to get, and even sent them complimentary 3-day fedex so that they would arrive in time for the wedding. They did. My bridesmaids LOVED them, and they were the perfect color of orange. They are absolutely gorgeous in pictures (against the smoke grey of the bridesmaids dresses) and were definitely needed because we're by the beach in Southern California." "I just wanted to send you a quick e mail to tell you how helpful your customer service representative was when I called with some order issues. He was so friendly and helpful with my order. I was also very impressed with your product. I ordered multiple pashminas for my wedding party (nine to be exact), and every girl told me over and over again how much they liked their pashmina. So, all in all your customer service was phenomenol only to be backed up by your wonderful product. Much thanks!" "I rarely feel inspired to give unsolicated positive feedback but my experience with The Pashmina Store made it hard not to do so. There are numerous suppliers of so-called pashminas but very few (from what I've seen) that offers the quality that you do. I took a leap of faith ordering a product that I have never held in my hands. However, my expectations were exceeded by far. Since the three pashminas were gifts for my bridesmaids, I must return soon to buy myself a gift! Thank you for a great shopping experience and here's a cyber-pat on the back to your great customer service team." "My pashmina matches very nicely...it will complete my wedding outfit. Thank you so much for all of your help. You assistance made my purchasing experience a good one. I will certainly recommend The Pashmina Store to anyone looking for that perfect cover." "Thanks for the perfect bridesmaid gifts for my daughter's wedding. Everyone was so pleased. Now I am getting one!" "The wraps I ordered are wonderful! I wasn't really sure what to expect when ordering from the internet and not feeling/touching/seeing the product prior to purchase, but have been blown away by the quality of the wraps. I purchased these as gifts for my bridesmaids, as well as one for myself to wear the evening of my wedding day. They are so soft and the color/quality was exactly as described! Exceptional quality and I will definitely visit this site again to purchase more! Thank you for the free and FAST shipping! I'm going to tell everyone about your site! Thank you! Thank you! Thank you!" "These pashminas are my wedding thank-you gifts for my bridesmaids, my mother, and my mother-in-law. I have ordered your pashminas before and just loved them. Thank you so much for offering such a wonderful product!" "Hello, I just wanted to say thank you for a wonderful shopping experience. I placed my order and the shawls arrived quickly in very nice packaging. The color is absolutely perfect. They will be worn by my bridesmaids in my wedding (and are part of their bridesmaid gift) so I am very, very pleased. Thank you and I will be certain to recommend your company to anyone who is looking for products that you carry." "Thank you for processing my order of the 4 new shawls so quickly. My wedding is tomorrow! I'm sure my bridesmaids will like them and they will go great with their dresses. Thanks again. It was a pleasure ordering from you." "I am getting married very soon and I had ordered pashmina wraps for myself and my bridesmaids. They arrived yesterday (extremely fast shipping, by the way), and they are absolutely beautiful...I'm actually surprised at how wonderful they are...much better than I could have even imagined. I just wanted to thank you so much." "I ordered shawls for my maid and matron of honor. They absolutely love them." "We were delighted with the pashminas we used for my daughter's recent wedding. Thank you for your excellent service and products. I was asked by several people at the wedding where I got such beautiful pashminas and I told them about your online store. Thank you for adding elegance and warmth to our special day." "Thank you for your excellent customer service. I just got married and ordered three shawls for my wedding. The product is beautiful and the service impeccable. I will definitely shop with you again and recommend you to others." "Charlene, we received the brunt orange pashminas and are thrilled. They are lovely and are perfect for my daughter's bridesmaids. Just wanted to let you know that we are very happy with the order. Thanks!" "The girls, including the bride, LOVE the wraps. They are beautiful and the quality is fantastic. We can't wait to show them off in November." "Hi - the Pashminas arrived and are wonderful. Thank you! I will need a few more for my bridesmaids. Many thanks." "I just received my order and am thrilled with the four bridesmaid Pashmina wraps I ordered." "Just as you promised I received the exact color pashminas that I needed. Thank you for your patience and helpfulness in getting me exactly what I wanted. It was a pleasure working with you." "I would like to thank you again for my last order of your beautiful pashminas. They will make a perfect bridesmaid gift. I would like to start my holiday shopping now so I'll be back soon." "Hi Charlene and Blair. I received the ivory and light grey pashminas yesterday and they are perfect for my wedding! Thank you." "I received my two wraps and love them. I'll order 7 additional wraps for the wedding. Thanks again -- the wraps are great!" Please contact us now to discover how we can help with your wedding, both as part of the ceremony and as bridesmaid gifts.